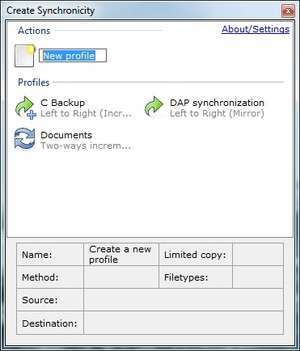 Synchronicity is a small and portable freeware and open source backup application which can synchronize and restore your backups. It supports several languages through its interface and makes the task of keeping things backed up simple and easy. Several customization options are available. For security reasons, you should also check out the Create Synchronicity download at LO4D.com which includes virus and malware tests. Additional screenshots of this application download may be available, too. Create Synchronicity download been highly rated by our users.